A passenger boarding Le Boreal is instantly immersed in French language, culture and cuisine, beginning with the welcome from the ship’s captain and his officers, all of whom hail from France. Shipboard announcements and lectures are routinely delivered in both French and English. Even the mandatory muster drill on the first day offers non-French-speaking passengers a chance to improve rusty high school language skills. We are among eight Americans aboard le Boreal as it sets sail on a 11-day, late summer cruise from Boston Harbor en route to Montreal. Of the 192 passengers on board, another handful or two are English-speaking, from the U.K., Australia and Canada. But the complexion of the ship is decidedly French — not only because of the predominance of French-speaking passengers (from France, Switzerland and Belgium) but in terms of ambiance and style as well. In operation since 1988, Compagnie du Ponant (Ponant) is the only French cruise line. The company sails four vessels, including the two-year-old Le Boreal and its one year younger sister ship, L’Austral, which are the newest additions to the fleet. With 132 suites and staterooms, Le Boreal is categorized as a small ship. It has achieved international Cleanship designation for its eco-friendly features. The two other vessels in the line are even smaller: Le Ponant, a 32-stateroom sailing yacht, and Le Levant, slightly larger with 45 staterooms. Like its sleek exterior, the interior of Le Boreal is devoid of the glitz and bling typically associated with newer cruise ships. Its French designers have used subdued colors, textures and wall prints to create a refined but relaxed ambiance. The contemporary layout and interior design are reminiscent of boutique urban hotels like those designed by Ian Schrager. Similarly, one might be more apt to describe the mid-ship reception lobby as cozy rather than dazzling. There are a number of appealing spaces to relax throughout Le Boreal: a pool and sun deck, an open-air bar, a panoramic lounge and a main lounge, a theatre with plush stadium seating, a photography viewing gallery, a library alcove, a Wii-equipped play area, a small boutique, a fitness center and a full-service Carita spa (from Paris, naturally) and salon. In a look that might easily be mistaken for a Roche Bobois showroom, the two lounges are furnished with modern, white leather chairs and inviting taupe sofas with lumbar throw pillows, all nicely spaced and arranged in inviting conversation areas. Because the ship is small, it’s easy to get around without getting lost. Our 200-square foot “Prestige” stateroom on Deck 5 (#510) has a 40-square foot private balcony (outfitted with two small chairs and a table) and floor-to-ceiling, almost wall-to-wall glass doors, allowing for plenty of natural light and scenic views as we travel from port to port. The white, fluffy king-size bed is accented with soft fabrics of pale gray and crimson. Staterooms are tastefully decorated in ash-colored wood veneers with white leather accents on the double-door closets, quilted headboards and paneled dressers. Each cabin has a stocked pay-as-you-go minibar, small desk, flat-screen TV and iPod dock. Bottled water is complimentary and refreshed as needed. There is ample drawer and closet space to fully unpack and settle in comfortably. With a bit of European flair, the bathroom in each cabin is divided into two separate stalls, adjacent to each other with separate doors. One holds the toilet; the other houses a combined tub/shower and sink with small storage vanity beneath. The sliding panel outside the bathroom wall near the sink is a whimsical and unexpected design flourish. When the ship isn’t docked at port (or within view of another vessel), the panel can be slid back, revealing a glass wall that allows the occupant to bathe, shower or shave in the buff with ocean views. The citrus-verbena L’Occitane bathroom toiletries evoke a scent of Provence. There are two open-seating restaurants and 24-hour room service is available at no extra charge. The main restaurant, La Licorne, is strikingly modern with tables of different shapes and sizes where meals are served á la carte. The more informal La Boussole serves a large variety of hot and cold dishes buffet-style, with wicker chairs and tables both indoors and outside on the adjacent patio. The menu is continental, showcasing international themes on different nights. At lunch, vegetables are often julienned and fruit is diced. Freshly baked croissants are served at breakfast, and French rolls and baguettes are served at every meal. The dessert course, labeled in French and English, emphasizes French specialties like chocolate mousse, crème brûlée, St. Honoré cake, chocolate torte cake, éclairs and fruit sorbets. The Tropezienne is as delicious and memorable as one eaten in St. Tropez. Complimentary house wines are served with meals. Cocktails, liquor, premium wines and specialty coffees are additional. Small ships can enter smaller waterways and ports that often need to be bypassed by larger ones. 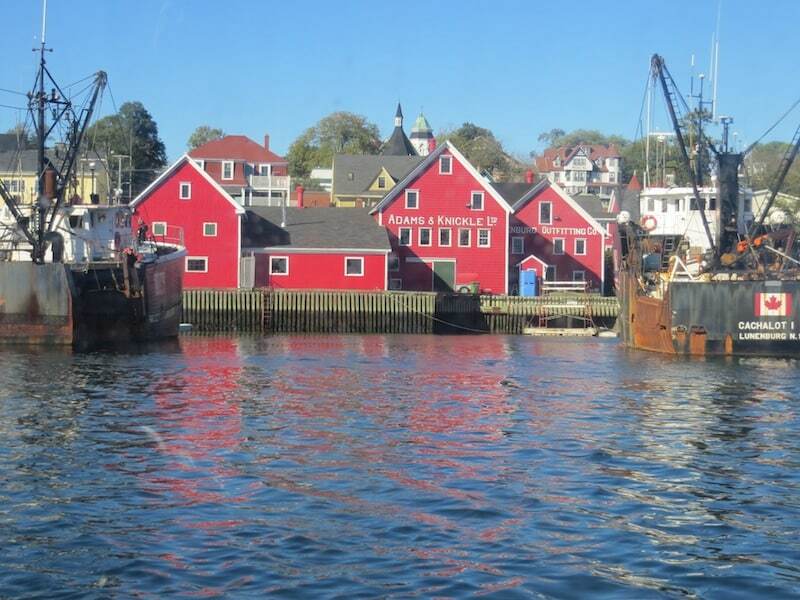 On our cruise, after its first stop in Bar Harbor, Maine, Le Boreal makes its way to Lunenburg, Louisbourg, Iles de la Madeleine, Gaspe, Havre Saint Pierre, Tadoussac, Saguenay, Quebec and Montreal in Canada (many of them French-speaking ports). At each port, small group excursions (with fewer than 30 persons) are offered in French and English with bilingual guides. Educational lectures about the ports and their history are held each day. As we headed towards Quebec, a French historian delivered an impressive lecture on the life of Samuel Champlain. There are no grand musical extravaganzas or rock climbing walls but there are evening shows featuring dancers, musicians or a chanteuse. The ship will appeal predominantly to active, affluent travelers, ages 50 and over who want a different, more European, small-ship experience. Service by the international crew of 137 persons was, perhaps, a little bit less polished and solicitous than on other cruise lines at comparable price points, but the crew were generally helpful and professional. The standard size cabins run a bit small for Americans but have that “je ne sais quoi,” perhaps, emphasizing form over function. Although it made for lively dinner table discussion, it is impossible to decide whether Le Boreal is truly a yacht or a ship because it falls between the two in terms of size and style. Certainly, the vessel is smaller than most large cruise ships, but it doesn’t achieve the intimacy or caché associated with a private yacht. It scores high for offering a unique and enjoyable cruising experience under a French flag: On that account, it might best be called a “bateau” in a class by itself. Depending on the time of year, Ponant offers varied expedition itineraries from Antarctica to the Arctic, including South America, the Caribbean, the Mediterranean, the Baltic, Asia and the Indian Ocean. A range of other stateroom accommodations includes a 484-square-foot Owner’s Suite and three Deluxe Suites of 290 square feet each. Also, many of the Prestige staterooms can be flexibly reconfigured into 398-square-foot Prestige Suites. This sounds heavenly! I would love to enjoy a cruise like this. Oh this sounds absolutely lovely. Thanks for the great report. Would love to check out this cruise at some point. Although I’m not a cruise-kind-of-gal, I must admit that this sounds lovely. If I could cruise (without getting seasick), I do think I’d prefer a small ship to some of the other huge ships, which to me, feel like floating hotels. Thanks for this post, the perfect cruise for my son and his French wife. Will forward the post. Wow, a king size bed and a sizable state room, that’s unusual on a cruise ship. The last cruise we went on felt so overcrowded, this sounds lovely. The one and only time I cruised, we were invited to dine with the captain. When the menu arrived, I was glad I wasn’t the only one who couldn’t read French! The waiter had to interpret the whole thing for the entire table. All of the other tables got English menus, but I guess the French made the Captain’s Table seem so much more elegant! Great story, Kris! Thanks for sharing. Irene — Thanks so much for making me aware of this. It sounds like a blast — the kind of cruise I’d love. Sounded like a great cruise. A small cruise line is definitely the way to go.